Louie Psihoyos, Academy Award-winning director of The Cove has created another successful film—Racing Extinction—that exposes the threat of mass extinction for various endangered species. After attending a screening in New York and interviewing different audience members, it seemed that the film resonated with a broad audience; even those who do not consider themselves to be environmental activists were motivated to make a difference. What made this film so effective? One defining feature was the contrasting usage of low-quality undercover footage with high-quality technological elements. By combining the two, the film was able to show the horrors of the endangered species trade without overwhelming the viewer. Psihoyos made a comment after the New York premiere that a majority of underground footage was ultimately not used because it was too graphic (and would likely isolate the audience). Instead of feeling hopeless at the end of the film, the viewer feels uplifted that changes can still be made. An example of how this was achieved was a storyline focused on a small hunting village in Indonesia. Psihoyos showed the progression of rigidity within the community; from those set in their ways to continue hunting endangered manta rays for a living to some open to converting to a tourist-based economy built around the animals. In a recent interview, Psihoyos describes how his film and crowd funding activists have made this transition possible. Throughout the film, the advanced use of technology created a sense of hope. 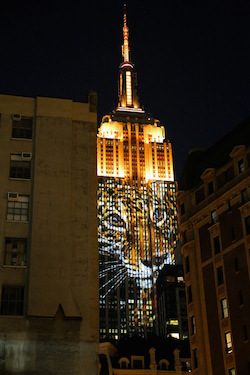 The film ended with footage of large-scale images of endangered species projected onto the Empire State Building (among other structures) in New York City, and thousands of people stopping to look at these images. The viewer sees that people are willing to pay attention to what is happening with endangered species and mass extinction around the world. This is the important first step to affecting real change. The film also touches on the impact of globalized industrial agriculture, and the loss of biodiversity and contribution to climate change. The ending also includes a call to action encouraging viewers to consume more plants, instead of animals, to reduce personal carbon footprints. For more on these issues, take a look at Brighter Green’s policy research on the globalization of factory farming. Instead of filling the film with heavy statistics on the negative effects of losing a species in a complex ecosystem, Psihoyos focused on the intrinsic value of each species, which, will admittedly anthropocentric, resonated with many of the people I interviewed. Ultimately, this film has the potential to do exactly what it set out to do: change the world.